Lab suppliers working to meet researchers and sell lab equipment in Washington may want to take note of the upcoming Pullman BioResearch Product Faire™ Event at Washington State University, Pullman. Biotechnology Calendar, Inc. is hosting the Pullman BioResearch Product Faire™ Event on October 22nd, 2013. Last year, 222 people attended the Pullman BioResearch Product Faire™ Event. Of the attendees, 42 were purchasing agents, professors and post docs, and 18 were lab managers. The visitors came from 25 different research buildings and 41 departments around campus. How many hours of canvassing the Washington State University campus would it take to meet so many potential leads? 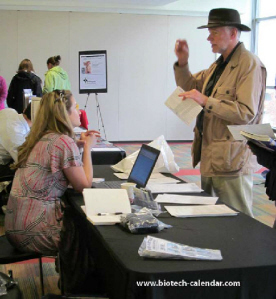 Biotechnology Calendar, Inc. life science marketing events allow you to meet researchers in just a few hours. There is also a great deal of NIH and NSF research funding available at Washington State University, Pullman, making Biotechnology Calendar, Inc. life science marketing events at the university a great way to generate meet researchers interested in buying lab products. In 2012, the NIH gave Washington State University $19 million in research funding, while the NSF gave the school $21.9 million in research funding. Our life science marketing events are the perfect opportunities to sell lab equipment to a market that is in need of life science products. Researchers conducting work in their labs attend Biotechnology Calendar, Inc. trade shows because the shows are only a short walk away from the lab or the classroom. Our delicious catered lunches are also a great incentive to attend and stay a while, enjoying great food and talking to sales reps about the latest and best technologies. Researchers value the experience of being able to put a face to a company. Perhaps a researcher at Washington State University has been buying your company’s lab supplies for some years now, but he or she has questions about new products As a sales rep, you’ll be there to answer those questions in depth and create a positive connection with a customer. Some researchers at Washington State University may purchase their lab needs from a competitor. Are your products more attractively priced? Do you create a product that will save hours in the lab every week? Perhaps you know that your products are of a higher quality, or is your company more environmentally conscious during the manufacturing process. These are facts researchers will want to know when thinking about whether to continue their customer/ supplier relationship with another company. Biotechnology Calendar, Inc. life science marketing events help researchers to think more in depth about their lab supply needs, and by talking to sales reps at our events, they gain a better understanding about how they can save money or time in the lab, and thus be more productive. 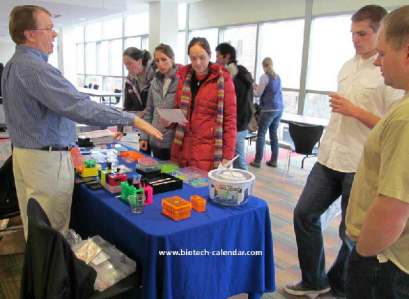 If you are a lab supplier working to meet researchers and sell lab equipment in Washington, Biotechnology Calendar, Inc. invites you to attend our Pullman BioResearch Product Faire™ Event on October 22nd, 2013. Biotechnology Calendar, Inc. is a full-service science research marketing and events planning company that organizes life science marketing events at top research institutions nationwide. If you’re interested in attending life science marketing events closer to home, we encourage you to view our 2013 calendar of events and 2014 calendar of events. For more information on our Pullman BioResearch Product Faire™ Event, or to view more funding statistics for Washington State University, click on the button below.